Master Email Address Verifier verifies the validity of e-mail addresses in mailing lists. It works on the same way as a mail server. 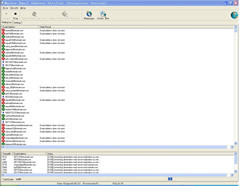 The program tries to connect with e-mail addresses' SMTP-servers and simulates sending a message, but does not send the message out. It disconnects as soon as mail server informs if this address exist or not. Master Email Address Verifier can find out dead addresses, it can save time and money for businesses who send newsletters to their clients, or any person or business that needs to maintain a clean e-mail contact list. 2) Support to save verified result to Text, CSV, TSV and Microsoft Excel files. Allows you to save successful or failed email addresses to separated files. 4) Real-time display the verification result, processing, verification duration time etc. Order Master Email Address Verifier NOW!